I am going to have a hard time reviewing this film. It was utterly forgettable and nowhere near as interesting as the first two films, which were not that great themselves. 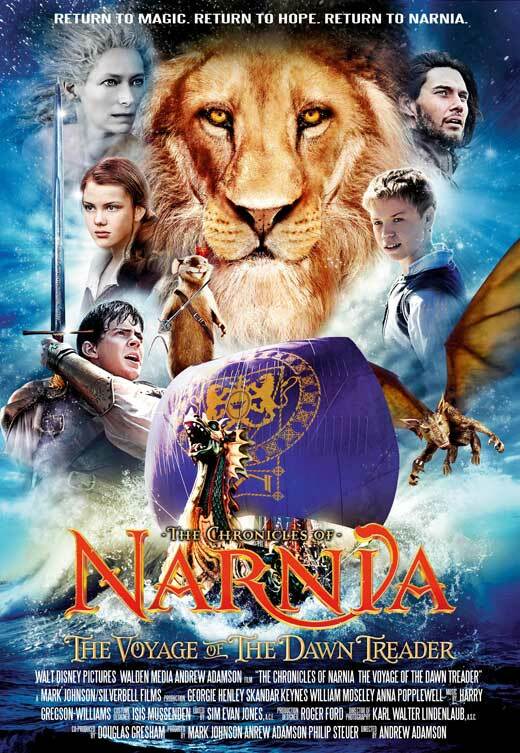 The third Narnia movie, The Voyage of the Dawn Treader, took nearly everything that was good about the first two films and gets rid of it or tries to replace it and fails. The best parts of the first two films were the older two Pevensie kids, especially Peter (William Moseley) and his sibling rivalry with younger brother Edmund (Skander Keynes). This rivalry is not there for this film as Peter does not go to Narnia this time around, the only time he appears is during a dream sequence. He is sorely missed during this film as he had the most charisma of all of the four Pevensie children. The lion, Aslan, also barely appears. Aslan was the highlight of the first film. The second movie, Prince Caspian, suffered due to his smaller role and he appears even less in this third movie. I always try and write a little blurb about the plot of the films we watch, but I am really struggling with this movie. I can barely remember what happened. Edmund and Lucy (Georgie Henley) are in England staying with their uncle while their two siblings are off in America with their parents. This raises some interesting questions like why would you leave your two youngest children in a country that only recently was the centre of a world war. This sounds like borderline child abuse and if I was Edmund, I’d have been straight on the phone to child services, or the 1940s equivalent. Regardless, they are there with their uncle and extremely annoying cousin, Eustace (Will Poulter, who grows up to be the nerdy son in We’re the Milllers) and the three of them get swept back into Narnia. There they find Prince Caspian (Ben Barnes) who is on a voyage to find seven guys who fled when his uncle was a jerk during the last movie. Which brings me to another complaint I have about this film, in between the first and second film, it was one year in England, and that equated to hundreds of years in Narnia. When this film begins it is another year later in England, but only three years in Narnia. How can that be, it just makes no sense. According to Sally, this is how it is in the books, but I don’t care. This is ridiculous and annoying. I can’t write too much more about this film. I found it uninspiring and instantly forgettable. The book has a boring plot that seems to lead nowhere, and the leads are all not interesting at all. The only character I liked was Eustace, he was a good addition to the cast and added some much needed comic relief. I also enjoyed Simon Pegg as the voice of the mouse, Reepicheep, but other than that, this third instalment in the Narnia series leaves a lot to be desired. Before viewing The Voyage of the Dawn Treader I assumed that it was less popular than The Lion, the Witch, and the Wardrobe or Prince Caspian because half the original cast was no longer in the story. Boy was I wrong. This movie is worse because it has a flimsy, terribly written script. Still, I’m going to defend this movie as much as I can. I have a major soft spot for this book series, though admittedly Dawn Treader was always my second least favorite of the bunch. The problem I always had with this book is that it is very episodic in nature. The overall story follows the ship sailing East to the edge of the world, stopping at islands along the way to search for the seven lost Lords of Narnia. There’s no overarching danger. Everyone sails East, and then (almost) everyone goes home. The movie tries to rectify this by adding a villain, but it appears the scriptwriters put approximately two seconds of thought into developing this “character.” The primary nemesis is a weird, green mist being generated by the Dark Island, a place that brings your nightmares to life. The mist demands human sacrifice… for what reason I’m not sure. My main issue with the invention of a villain is that it completely undermines the spirit of the book. In the novel members of the crew are faced with tests of character. The villain is their own self-doubts and character flaws, based largely on the seven deadly sins. Lucy is confronted by vanity; Caspian and Eustace (the Pevensie’s unimaginative cousin) by greed; Caspian later by pride. The turmoil in the book is almost entirely internal, which I concede is difficult to translate to a visual medium. Other changes made for pacing purposes I completely agree with– namely Eustace’s transformation into a dragon being expanded– but the whole evil mist antagonist plot feels ill conceived and is never properly flushed out. On a positive note, Dawn Treader has a much more magical feel to it than Prince Caspian did. Caspian tried too hard to be an action-adventure, and felt disconnected from the Narnia presented in Wardrobe. We’re treated to some stunning visuals and well done CGI effects this time around, which were sorely lacking in the previous installment. Lucy coming across a spell book on one island was especially well done, and reminiscent of the book’s scene. I also absolutely loved Will Poulter as the Pevensie’s cousin Eustace Scrubb. I’m hoping that if The Silver Chair is brought to the big screen (there’s a strong possibility it will be) that Poulter won’t be recast. He was the perfect jerk at the beginning of the movie, but by the end I genuinely liked him. I believe he’s charismatic enough to carry the next film, provided the right actress is cast as his costar. Overall though, Dawn Treader was a big disappointment. I knew there would be some changes to the plot, but very few felt justified or necessary. The magic was back, but not in big enough doses. Still, I’m holding out for further films in this franchise. I’m still desperate to see The Horse and His Boy and The Magician’s Nephew brought to life.